On this page you can check out some goods you can buy if you want to support us. All of the items shown are of good quality. You can always contact us if you want more information (please put 'support' in the subject line). Click on a thumb to enlarge the image. 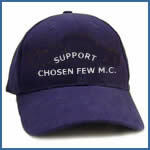 WARNING: These items can only be purchased by people who are officialy affiliated to the CHOSEN FEW M.C. BELGIUM.